The King and I: Shall We Dance? The King and I, Music by Richard Rogers, Lyrics by Oscar Hammerstein II, North Shore Music Theatre, 9/27/11-10/9/11, http://www.nsmt.org/index.php?option=com_content&task=view&id=940&Itemid=2275. 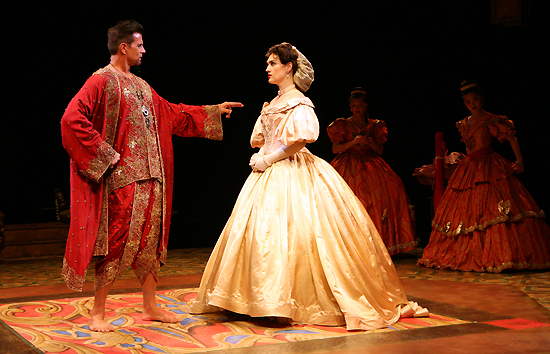 (Beverly, MA) The North Shore Music Theatre’s The King and I opened this week with television, stage, and film star Lorenzo Lamas in the iconic role of the King, joined by Kate Fisher as the strong-willed widow and teacher, Anna Leonowens. The first act opens with the round stage transformed into a ship deck, bringing Anna and her son, Louis (Giacomo Favazza), to the frightening and unknown world of Siam. Their duet, “I Whistle a Happy Tune” is delightful. Soon, they are greeted and escorted to the royal palace by a convincingly imposing Kralahome (Mel Sagrado Maghuyop). Our introduction to Lamas as the King is unremarkable, but the introduction to his children in “March of the Siamese Children” is precious. The local children in these roles evoke ooh’s and aah’s every time they appear onstage. The production finds its momentum with Fisher’s thoroughly enjoyable verbal assault on the King’s behavior in “Shall I Tell You What I Think of You?” Lamas’ personal enjoyment of the role becomes apparent in the Act 1 Finale, and his charming interplay with Fisher finally draws in the audience. The highlight of the second act is “The Small House of Uncle Thomas.” Beautiful, expressive choreography blends perfectly with a small, but powerful group of singers, while the dancers and the opulent costumes complete the piece. Also noteworthy are the two young lovers, Tuptim (Manna Nichols) and Lun Tha (Joshua Dela Cruz). Their voices pair beautifully together as they perform the show’s love songs. The King and I at North Shore Music Theatre is an enjoyable and traditional production of an American classic and plays through October 9th. This entry was posted in Musicals and Opera and tagged 2011, Anna, Giacomo Favazza, Hammerstein, Kate Fisher, Lorenzo Lamas, Manna Nichols, North Shore Music Theatre, October, Rogers, September, Siam, The King and I, The Small House of Uncle Thomas, Whistle a Happy Tune by leahwhite. Bookmark the permalink.